The author is an engineer and lawyer who has spent more than forty years in the industry. Rosenstein begins his story in the mid-nineteenth century. He reminds readers that everyday tasks were time-consuming, back-breaking tasks before the advent of electricity. Soon electricity would transform life in the home, on the farm, in the office, in the factory, and on construction sites. Before that energy could be utilized, someone needed to invent the electric light bulb. 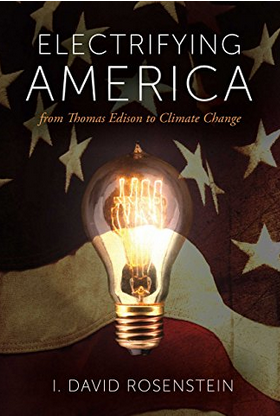 Thomas Edison already possessed a long list of inventions before tackling electricity. His work with the telegraph, telephone and phonograph had great potential. Unfortunately, Edison was a lot better at inventing than implementing his ideas in the business world. The fatal flaw in Edison’s direct current could be found in its limited ability to deliver electricity at any distance from a dynamo. After presenting the early history, Rosenstein moves on the powerful monopolies of the 1920’s, and the Golden Age of Electricity after World War II when the world turned back to business development on the home front. He talks about the failures of the industry in the Great Blackout in the Northeast in 1965 and traces the crises of the Oil Embargo of 1973 and the difficulties in California during the 90’s. By the end of the 1900’s retail electric companies had begun to access electricity through a system of independent suppliers. Then the author discusses recent history and the issues leading up to climate control and the Paris accord. He ends the book by stating his opinion that a reconsideration of the concept of energy supply responding to public sentiments will likely lead to substantial changes in the future. This story is an interesting study written by an expert in the field in layman’s terms. The concise book contains less than 150 pages and is easy to follow. Students who have an interest in history, electrical engineering and inventions would find this book a good resource. 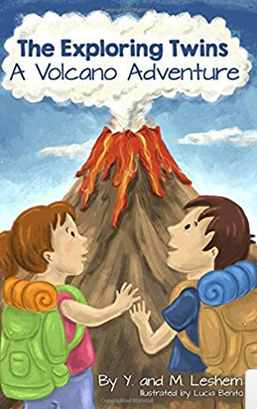 Recommended for anyone age ten or older. Everything You Wanted to Know About Owls! There are more than 200 species of owls living on every continent except Antarctica. They live in forests, deserts and the tundra. Owls are raptors or birds of prey. They might be as small as six inches or as large as three feet. Owls are territorial and tend to reuse their nest. They have huge eyes and excellent hearing. Their specially designed wings enable them to be silent in flight and their feather colors help them to camouflage themselves. Sharp and powerful talons and claws assist in capturing and holding prey. Many owls have names determined by their environment like barn owls and snowy white owls. Different types of owls emit different calling sounds; the Great Horned Owl makes the familiar, “Hoo, Hoo sound, while the Barred Owl vocalizes a call similar to a monkey. 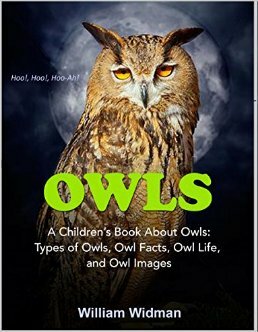 The author includes photographs of each type of owl, as well as nesting pictures and owls in flight. They are colorful and detailed. He suggests that you carry binoculars and a journal pad while owl watching in the woods. I really enjoyed the links provided within the book that allow the reader to hear and experience the sounds that various owls emit. Recommend this book for children ages six and older who enjoy reading about animals. Librarians and teachers should consider adding this nonfiction kindle book to their reference collection. Looking for activities to celebrate Earth Day? Help your students learn vocabulary while they learn about caring for the planet. Help your students learn vocabulary while they learn about caring for the planet. Make musical instruments from recycled materials from home. Then have a mini-concert to show off your class talents! Finally, help your students learn vocabulary while they learn about caring for the planet with this free word search. Ecology, recycle, sustainable…and more! This free Earth Day worksheet is appropriate for learners 3rd to 6th grade. The search contains 21 Earth Day vocabulary words. Happy Earth Day! Your feedback is very much appreciated. Thank you! Build Interactive Rubrics in Record Time! Why don’t teachers like to make rubrics? Because it’s difficult and time consuming. But that all changes with this tool! Wow! I am pumped! I just returned from the Google Summit in Lethbridge and couldn’t be more excited about the multitude of new tools available with Google for Education. At the summit I presented a session highlighting new way to use Google sheets to lighten your work load when it comes to making rubrics for any classroom activity! Intrigued? Read on! In my role as Assessment Coach for our school division, it’s my job to help teachers implement best practices when it comes to assessment. To this end I’ve been using doing a lot of research and having great conversations with teachers about how to involve kids in their own assessment. Can our students be involved in the process of collecting, organizing and presenting their evidence of learning. Better yet, can they be responsible for it? Yes. Yes. YES! How? First of all we have to let them know what their learning goals are. This is where outcome or standards based assessment shines. When we share with our students the targets we want them to hit it gives them confidence to streamline their efforts toward those goals. Clearly identifying those goals and communicating them to your students is the first step to success. One way to accomplish such a lofty goal is to break open the rubrics! (And yes, it is just one of our goals, but an important one.) Well built rubrics use specific language that allow students to see clearly defined expectations of work quality and depth of understanding. Rubrics are useful, however, not as an after thought for marking student work. Instead rubrics must be used at the beginning of the learning process as a means to involve the students in identifying their learning goals and being invested in the assessment process. When used in this way, rubrics provide the road map for learning success. The challenge? Designing well built rubrics is downright difficult! Time and time again, teachers express to me how difficult it is to come up with the right wording for their rubric. It’s a time consuming process that must be repeated and tailored to each new activity, project, unit or lesson. My question is… why keep re-inventing the wheel? What if we could have a bank of rubric descriptors that we could use for a variety of different purposes. What if we could use that descriptor bank in a myriad of combinations to populate and make a custom rubric for each unit or all the performance based activities within a unit. Yes… what if? That was my thinking when I decided to make interactive rubrics. Can you see the possibilities? Could this same process be applied to make other useful tools for assessment in the classroom? Absolutely! The response from teachers throughout our school division—to this time-saving tool— has been phenomenal. They love it! It’s so good that we can’t keep it to ourselves. I’ want to pass these helpful tools on to my subscribers. If you are interested then subscribe here to my newsletter and I’ll send you a very special access to a pre-built science rubrics for any grade 1 – 9 ( Disclaimer: They are built for the Alberta Curriculum, but I suspect that with some minor tweaking in the wording they can fit your curriculum, too. They are totally editable but not edible.) You’ll also get access to a prebuilt blank rubric, and step by step video instructions on how to use them to make your own interactive rubrics for any subject. As always, those who sign up will find these language posters included. P.S. I’d love to hear how you use these rubrics in your classroom. Respond in the comments below or drop me a line! The sun is shining and the birds are singing. I notice a few wild raspberries blooming among the shrubbery, and it reminds me of walking with my children happily collecting and eating the berries as we ambled through the countryside. Today we don’t find nearly as many bushes growing untamed along the roads as more construction and fewer farms are seen in my area. Still I wondered where did these berries come from and how did they get here. There is some archaeological evidence that Paleolithic cave dwellers ate raspberries. Red Raspberry, or Rubus idaeus, is native to Turkey and was gathered by the people living in Troy as early as the first century B.C. Rubus idaeus means bramble bush of Ida named for a nursemaid and the mountains on which they grew in Crete. During the Hellenistic Age they were associated with a Greek fertility myth that the berries were white until Ida, the nursemaid of Zeus, pricked her finger on one of their thorns and stained them red. Later on the Romans conquered vast territories and spread the seed of raspberries throughout their empire as evidenced in archaeological ruins of buildings and forts. These berries are mentioned in the fourth-century writings of Palladius, first Christian bishop of Ireland. During the Middle Ages raspberries were used for food and medicine. Artists employed their red juice in paintings.Only the rich could afford them until King Edward I in England encouraged their cultivation and made them popular in the late 13th century. The red raspberry may have originally come to North America with the prehistoric peoples crossing the Bering Strait. Explorers arriving in North America found Native Americans eating berries of all kinds. They dried them to use while traveling. European settlers brought seeds and new species of hybrid plants. In 1737 William Prince established the first plant nursery on the continent in Flushing, Queens, NY, and raspberry plants were listed for sale. Estate records from George Washington’s home in Mt. Vernon, dating from 1761, reveal raspberries being cultivated there. One hundred years later, more than forty varieties of raspberries were known throughout America. Luther Burbank introduced many raspberry hybrids to Americans. He produced a multitude of crosses providing an unlimited variety of qualities. These raspberry plants may be a bush or a vine that grows up to three feet high. Their fruits are ready to eat right off the stems and separate easily by using your fingers, as long as you are careful of the prickly thorns. Wild berries supply food for birds and small animals. Many useful products are gleaned from raspberries: jam, jelly, juice, pies and ice cream. Health benefits are limitless. Raspberries contain high amounts of antioxidants that are believed to fight cancer and heart disease. The high content of Vitamin A, Vitamin B1, B2, and Vitamin C, and Niacin keep our bodies strong. In addition the minerals of calcium, phosphorus, iron and potassium benefit all. Today more than 70 million pounds of raspberries are sold within one year. So take a walk this spring to see if you can find some of these tasty and healthy raspberries. I just learned about this awesome review/flash card tool called FLIPPETY that I am flipped out for and excited to share with you! Let me explain. Make a copy of the template, change the questions and name them. Go to file ->publish to web ->publish. Then copy the link. Click on “get the link here” tab. Paste the link into the light blue cell (you’ll see the tab at the bottom of your flippety doc), to get the link to your flashcards. Click on the link to view your cards. Be sure to bookmark or post the link, so you can access them easily in the future. Wallah! You are done. You can share the link with parents, collaborative teachers, or your students so they can access the review from any device. Cool, huh? I made this review for my class in about 5 minutes. It was easy and fun. You can even color code the flash cards according to question type, or just add color for interest. Check it out! This tool is now on my list of “Most useful” for the classroom. I hope you find it useful in your classroom, too! Sharing is caring! If you found this post useful, please share, like or tweet about it! And before you go, be sure join our weekly newsletter so you’ll never miss another post. Newsletter subscribers also have exclusive access to fabulous freebies. Each week I give away new resources for your classroom, absolutely free! Sign up to get access to these freebies each week!